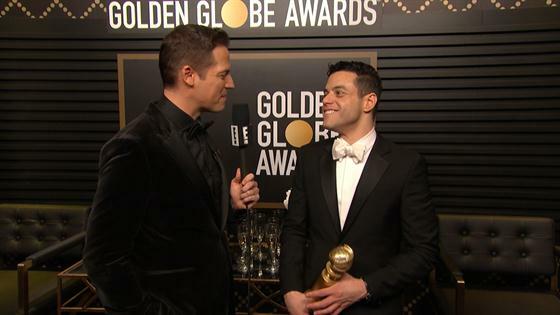 At 37 years old, Rami Malek just became Hollywood's breakout star. Though Malek had picked up award trophies for his work on USA Network's celebrated cerebral drama Mr. Robot, it wasn't until he stepped behind the mic to portray Queen's iconic frontman Freddie Mercury in 2018's Bohemian Rhapsody that the Egyptian-American actor officially made the transition from acclaimed actor to unabashed movie star. And at the 2019 Golden Globes on Sunday, Malek beat out Hollywood heavyweights such as Bradley Cooper and Willem Dafoe to take home the award for Best Performance by an Actor in a Motion Picture – Drama. Bohemian Rhapsody also winning Best Drama, with most crediting Malek's stunning portrayal of Mercury for the film's success—both critically and commercially, earning over $700 million worldwide, making it the highest grossing biopic of all-time. Of course, with the smash success of Bohemian Rhapsody comes an intense spotlight on Malek, who is as fiercely private as the man he portrayed in the movie. In October, just ahead of Bohemian Rhapsody's release, a fan got to see just how private Malek is when they approached him on the street, asking him to record a video for his friend. The problem? The fan, Xan Black, was already recording. "No, but we can take a picture, is that alright?" Malek replied. "THIS IS PROBABLY THE MOST EMBARRASSING THING TO EVER HAPPEN TO ME," the caption for the seven-second video read. Of course, it quickly went viral, getting over 3 million views in less than one week. It was cringeworthy. It was awkward. It was captivating. Soon after, Malek addressed the viral moment in an interview with E! news on the rec carpet at Bohemian Rhapsody's New York City premiere. "I am who I am and people can interpret that how they want, but I love the fans, I wouldn't be here without my fans and I try to take as much time as possible," he said. "Sometimes, when you've been traveling around the earth a couple times, you try to just be protective of your time as a human being. And I'm finding it quite funny." He further addressed the video in an interview with Vanity Fair, he clarified he is "happy to take photos" with fans, but "I just want to be aware of what people are doing in the moment. When someone films you automatically, it's a bit intrusive." Malek has accounts on Twitter and Instagram, he doesn't post often and when he does, it's usually related to one of his projects or political issues when it comes to Twitter. His Instagram? There are just three photos—two with Stephen Colbert (in 2016 and 2017) and then one with Ellen DeGeneres from November 2018. While he has 1.7 million followers on the platform, he's not following anyone. In an interview with Vanity Fair, Malek admitted he "can't quite wrap my head around" documenting his life on social media. "Something about it is not right and a bit unsettling." But since Mr. Robot became TV's secret sleeper hit in 2016, Malek has become one of the Internet's boyfriends, thanks in large part to his unusual leading man role as Elliot, the morphine-addicted hacker/hero/anti-hero at the center of the show. He became The One to watch, per critics and experts, and watch they did, with Malek becoming the first non-white actor to take home the Emmy for Best Actor in a Drama Series in over 18 years in 2016. In his speech, he channeled his anti-social character, starting off his speech saying, "Please tell me you're seeing this too." He then went on to say, "I play a young man who I think is, like so many of us, profoundly alienated and the unfortunate thing is I don't know how many of us would want to hang out with a guy like Elliot." He then said, "There's a little bit of Elliot in all of us." His work on the drama was so impressive that even Robert Downey Jr. was in awe, with the star visiting the set after his e-mails to the star were unanswered. "Everyone should be studying this guy," he gushed to GQ. At the time, Malek pointed to the show's unique format—breaking the fourth wall by having Elliot directly address viewers—for making fans feel more comfortable approaching him. "Sometimes people will grab you like they know you. That's weird. There's a special relationship people have, because [on Mr. Robot] I'm talking to the audience," he told GQ. "And the size of my eyes. They maybe say hello a little bit too easily." Ah, yes, his eyes, which have been described as menacing and captivating in equal measure, have become somewhat of a signature for Malek. "I never think about it. I just try to experience things and when I get riled up I know that they can do some pretty involuntary things, or get very menacing at times," he told GQ of his eyes. "Even my mom comments on it quite a bit. 'You don't look like my son anymore.' I think it's like they say: the eyes are windows to the soul. I just said that in a GQ interview. Oh f--k."
Piercing eyes aside, Malek is aware he doesn't look like your "typical leading man," noting people often tell him he could be Michael Shannon's brother. "I always take that as a compliment," Malek said. "But someone said—when I said thank you—'No, he's not a good-looking person.' I think he's handsome." Given Malek's unease with being recognized, the chance to completely transform himself to play Freddie Mercury, one of the most famous entertainers of all-time, was too enticing of an offer to refuse. But it was a responsibility he took very seriously. "I was very cognizant of the work it was going to take to get anywhere close to becoming Freddy Mercury. I flew myself to London and put myself up and just got hammering away," Malek explained to E! News. "Piano lessons and worked with a movement coach and singing lessons—everything I could possibly do. And then I watched copious amounts of Freddie Mercury performances." Then, of course, there's the teeth, mustache and hair, which physically transformed Malek into Mercury, with his co-stars even being blown away. "I've known Rami for 11 years…so when he put on that mustache and the teeth and all of it, it was truly wild," Joseph Mazzello told us. "I got goose bumps because he just embodied him so perfectly." The fake teeth Malek sported to play Mercury, who was born with four extra teeth in the back of his jaw, have made countless headlines since the first trailer for Bohemian Rhapsody debuted, and the star admitted they were "pretty difficult to deal with" in the beginning. "We tried out all different sizes and when they first went in I felt very insecure, but immediately I compensated," he told The Wrap. "Physically, I started to sit with more posture and elegance and I thought, 'Oh, he is so elegant!' You see him covering up his lips and his teeth all the time, and I could never quite get the hang of it. But as soon as those teeth went in, it was done. It was little things like that that were very informative for me." Malek shed the signature black hoodie he's sported for seasons on Mr. Robot to don Mercury's flamboyant and colorful stage looks in the biopic. "He wasn't a follower of fashion, he created fashion or allowed people to dress in a flamboyant way," costume designer Julian Day told E! News of Mercury's fashion legacy. "He made it acceptable to do that—dressing up in women's clothes…I think they had their own distinctive style and I just think it allowed people to look at it and go, 'Well if Freddie can do it, I can do it.'" The hard work paid off when Malek saw himself in character for the first time, telling EW, "When you're able to open your eyes and see a different person staring back at you in the mirror," Malek told EW, "it's a very affirming moment." Malek was forced to address some private behind-the-scenes drama that became very public when it was confirmed in December 2017 that the film's director Bryan Singer was fired, and was was replaced by Dexter Fletcher with just weeks left in finishing the film. Malek and Singer reportedly clashed on set, with The Hollywood Reporter reporting the fired director was missing during production on several occasions, with his cinematographer having to step in. After Malek addressed his behavior to the studio, the two men had a confrontation. After his firing, Singer issued a statement, saying, "Rumors that my unexpected departure from the film was sparked by a dispute I had with Rami Malek are not true. While, at times, we did have creative differences on set, Rami and I successfully put those differences behind us and continued to work on the film together until just prior to Thanksgiving." Malek finally addressed the controversy in an interview with Entertainment Weekly, saying, "I can wholeheartedly say I would never let this film be unfinished. Every moment where there was a challenge on set, I just reminded myself: What would Freddie do? And I guarantee, he would've seen it through." But when a reporter for IndieWire tried to ask Malek about the director scandal several times, the actor tried to side-step the question before saying, "I'll be interested to see how you write about our director situation. Good luck. It seems like you're hellbent on doing it." Aside from critical acclaim, a Golden Globe award, his first minor brush with scandal and major buzz leading into the Oscars, Malek found a new love thanks to his time spent portraying Mercury, quietly splitting from his Mr. Robot co-star Portia Doubleday in 2017. In April 2018, Us Weekly reported that Malek was dating his Bohemian Rhapsody co-star Lucy Boynton, who plays Mary Austin, Mercury's muse/first fiancée, in the film. "He is so into her," a source told the magazine. "He goes and visits her in London all the time." Malek and Bonyton, 24, had never publicly commented on their relationship until recently, with Malek confirming their romance at the Palm Springs International Film Festival when he accepted the Breakthrough Performance Award. While he didn't thank her in his Golden Globes speech, he was photographed embracing Boynton, kissing her on the cheek at Fox's after-party after his big win. And an insider at the Hollywood Foreign Press Association's soirée told E! News "it was clear that they are together." Ahead of his first major win for Bohemian Rhapsody at the Golden Globes, Malek ruminated on his newfound fame and saying goodbye to anonymity. "There are aspects of it that will take some getting used to that I don't know if I'll ever get used to," he told USA Today. "I appreciate a certain sense of solitude and anonymity that I'm going to try my darndest to hang on to. This will probably make it a little more difficult." Well, with his awards campaign officially underway, the final season of Mr. Robot on the horizon and his directorial debut in the works, you can't stop Malek's A-list ascension now.